1) Have students purchase the books and hand them in as they enter the classroom. Then you redistribute the books, so no one gets the one they came in with. 2) Ask students to begin writing their answers on the third page of the book, so the first few pages should be blank. 3) Instruct students to flip the books over and upside down, and treat the last page as if it were the first. 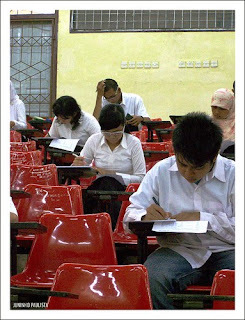 4) Supply your own blue books for the first exam and then use the ones students brought for the next exam. At the end of the year, you get "reimbursed" when students bring in books for the final exam, which you can use in a future class or return to the bookstore for a refund. We post a teaching tip every Tuesday! To submit your tips, email us at info@ctle.utah.edu and include "blog" in the subject header.